Mayor Bill de Blasio moved to end his inherited court battle over stop-and-frisk today, as he said he would, filing paperwork to drop the appeal. 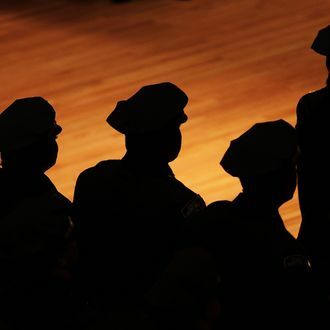 Last year, a judge ruled that the police tactic discriminated on the basis of race and ordered the appointment of a federal monitor to push reforms. Instead of Michael Bloomberg’s all-out rejection, the new administration announced a deal with the plaintiffs. According to the agreement, announced today by Mayor De Blasio and Police Commissioner Bill Bratton in Brownsville, Brooklyn, “ground zero” of the stop-and-frisk fight, the court-appointed monitor will serve a three-year term. The deal must be accepted by the District Court, at which point the De Blasio administration will officially drop the city’s appeal.